Home > miscellaneous	> Which Comes First? 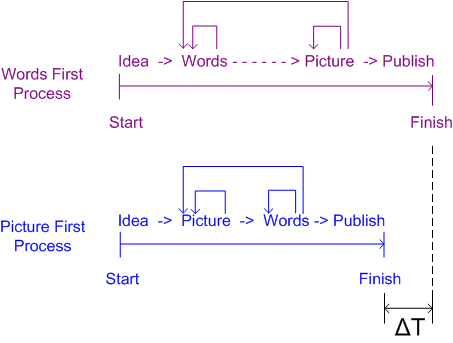 As the diagram illustrates, when I begin elaborating an idea with a picture first, I usually finish faster than when I start with words. I’ve also found that the picture-first process is usually more enjoyable. It just feels more fluid, less forced. When I start drawing a picture, the act of sketching simultaneously draws forth some words that match the drawing as it evolves into being. Those words then beget changes to the drawing; and then the emerging drawing begets more yet more words associated with the changing picture. It’s an Escher-eque recursive process that drives me forward until at some point I simply decide to stop and queue up the post to be published. Unsurprisingly, when I write/test product code, I use the same picture-first process (sorry, but TDD is not for me). I can’t count the number of times I started writing paragraphs of text and then stalled to a complete standstill when trying to concoct an accompanying picture. When that happens, I usually save the picture-less post to my drafts folder with the hope that when I revisit it again in the future a matching image will auto-magically appear in my mind. I have tons of picture-less posts in my drafts vault, but I refuse to publish a post without an associated picture. Some of those unadorned posts have hanging been around for years. In the 1000+ post history of this blog, you’d be hard pressed to find a post that doesn’t have at least one picture in it. It’s simply just the way I operate. Maybe you should try it.